Gene Huber from the Florida rally! Parking at the SE corner near Sear’s Tire Center. Check the website above, or this link, for more updates. 3. We support Donald Trump! 7. Tall walls Open Doors! The TC site is not the best pick. Open space as always--nobody will show due to difficulty transversing 8th street not to mention the government center has no traffic. How are we suppose to greet drivers and receive their honks? Yeah, I know that 31 is gonna be tore up, but do those road workes work on Saturday? A little help here? I have nothing to do on the scheduling or organizational end, Ms. Schwartz. I only passed along the information that I requested. But I can tell you that this event is being organized by the Michigan Conservative Coalition. If there are any questions or concerns regarding any of the locations listed above, my advice would be to contact them directly either via e-mail at info@michiganconservativecoalition.com or at 616-987-1124. Oboy, oboy, oboy, another opportunity to wear my Trump Garb. I've added a new pin "Drain the Swamp" Alligator Not to mention my trump buttoneer with real Trump hair (okay, not real hair). So you see, I'll need a bigger audience to model this garb--and the government center is not that place. My humble opinion: I was speaking with a few people regarding this. Maybe for the next one: 10-12 at various locations (county seats?) and then everyone caravan or meet at the Capitol for a 2-4....or whatever time frames. 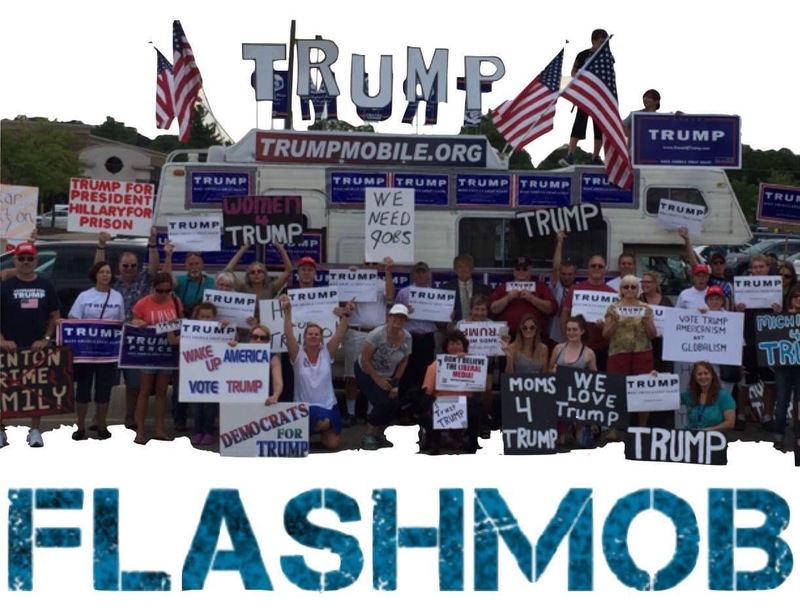 Attended another Flash Mob Trump Rally, in Traverse City. About 125 folks, many new faces. Counted five different counties represented. Homemade signs were great--one of my favorites "MOORE, CNN, DEM (circled with lines through them) Get over It. You Lost. Wah! Wah! Trump is our President." Another one was a 12 year old, or so, youngster with a T-Shirt which depicted Trump playing with Lego's with the statement "It's Gonna Be YOUG". There was a "Democrats for Trump" sign, and lots of flags, and spirit and Sun. There were Petitions being circulated asking Trump to declare the Muslim Brotherhood and C.A.I. R. Homeland Security Threats. Donuts, Coffee. As we were cleaning up, a couple of cars pulled in and were disappointed they missed it. Did I mention having fun?